Heat oven to 375°F. Remove pie crusts from pouches; place flat on work surface. With 2 1/2-inch round cutter, cut 12 rounds from each crust. Press each round in bottom and up sides of ungreased miniature muffin cup. Reserve dough scraps. In medium bowl, beat eggs with wire whisk. Beat in half-and-half, flour and salt. Sprinkle cheese and walnuts into each crust-lined cup. Pour egg mixture into each cup. Sprinkle each with roasted peppers and chives. If desired, cut small star or other shapes from dough scraps that have been rolled together; place on ungreased cookie sheets. Bake 7 to 9 minutes or until golden brown. 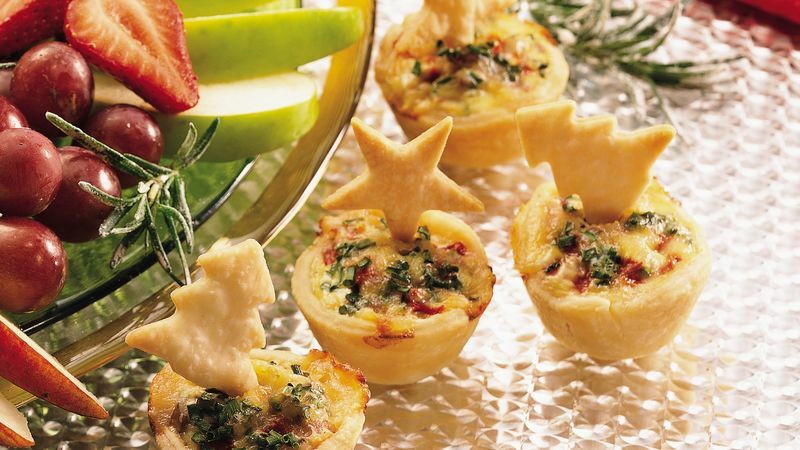 Top each tartlet with baked cutout. Store in refrigerator.